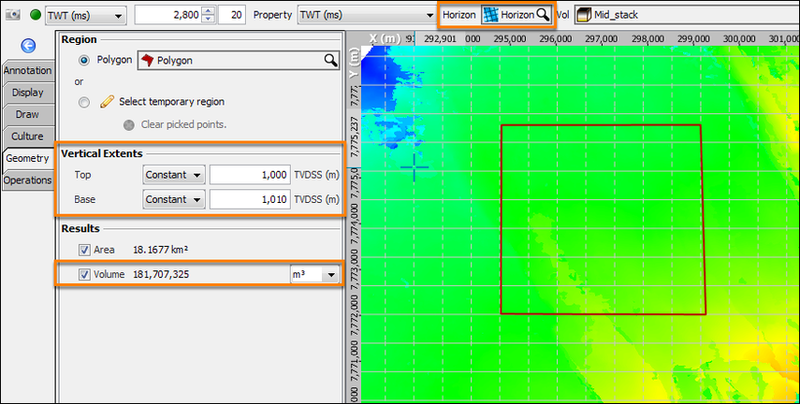 You can measure the space of an area and volume as constrained by a polygon in the map. These features require a polygon to be created in the map (see Picking Polygons in Map View), or you can use a temporary polygon. In addition, you can also measure the distance between two points in the map. In the Map View, open the Geometry tab. At Region, select Polygon to use a polygon that has been created in the Polygon tab in the Control Panel (see Picking Polygons in Map View). Select a polygon to be used in measuring the space within the polygon. 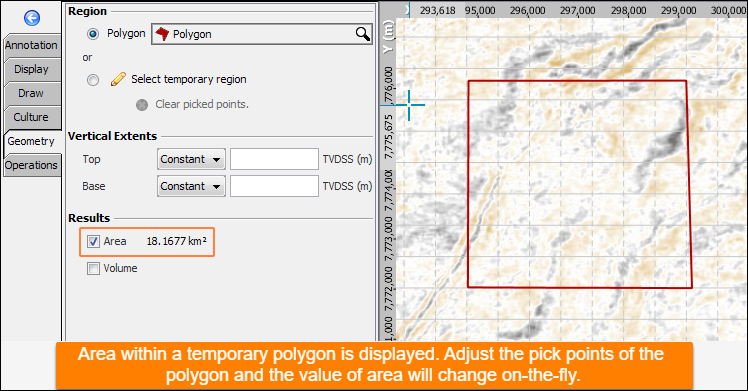 Alternatively, choose the Select temporary region option and click the pencil icon to enable the picking mode for a temporary polygon. Start picking the temporary polygon in the Map View. Double-click to stop picking or press Esc. You can delete the temporary polygon by clicking Clear picked points. In the Results section, select the Area check box. The total area covered within the polygon will be displayed. Note: The measurement unit for area in the Map View is displayed according to the preferred display unit selected in the View menu, Preferences window. In the Map View, select a Horizon in the navigation bar. At Region, select Polygon to use a polygon that has been created in the Polygon tab in the Control Panel. At Top and Base, select to use a Constant or a Horizon, or both, to be used as the top and base boundaries to measure volume. In the Results section, select the Volume check box. The total volume constrained by the polygon between the top and base boundaries will be displayed. Select the unit of measurement for volume in the adjacent drop-down box. Note: The options of measurement units for volume in the Map View are based on the preferred display unit selected in the View menu, Preferences window.